A major reason for growing vegetables at home is to produce crops of a higher eating quality than may be otherwise available. For shipping and storage reasons, many commercially-grown vegetables are picked before they reach peak eating quality (maximum flavor and nutrition). A home gardener has a distinct advantage of harvesting a vegetable at its peak quality. Knowing exactly when a vegetable has reached its best eating quality can be difficult to determine, especially for the first time growing a particular vegetable. Basket of vegetables picked at peak quality. Most vegetables attain their best eating quality when allowed to ripen on the plant, but often this peak quality is reached before the vegetable is fully mature (i.e. cucumbers, squash, okra, sweet corn, peas, and beans). As a result, many gardeners fall into the “bigger is better” mindset and allow crops to stay on the plant too long. For instance, novice okra growers may leave pods on the plant too long, opting for a larger product. However, okra pods quickly become over-mature and woody, rendering them inedible. Most seed catalogs and labels list days to maturity for crops. While this may be a helpful tool, especially when scheduling seed-starting dates, succession crops, etc., it is not always reliable for calculating precise harvest dates. There are many factors that influence a harvest date, including soil fertility, precipitation and temperature. As a result, actual “days to maturity” may be different from year to year. Therefore, a gardener needs to be aware of the subtle clues that indicate a vegetable is ripe for the picking. See the list below for tips on harvesting some common vegetables. Almost all vegetables are best when harvested early in the morning. Overnight, vegetables regain moisture that they lost during the day and starches formed during the day may be converted to sugars during the evening. These traits make morning-harvested produce crisper, juicier and sweeter. If you cannot harvest in the morning, produce should be kept out of direct sunlight and cooled as soon as possible to slow degradation. Vegetable quality is highest at the moment of harvest and begins to decrease rapidly afterwards. Be gentle with garden plants while harvesting vegetables. If vegetables are not easily removed when twisted or pulled, use a knife, scissors or hand pruners. These tools help prevent tearing or breaking of a plant which could lead to disease infection. Also, be careful not to step on stems or foliage of the plants while harvesting. Future harvests depend on a healthy parent plant. Finally, frequent picking is essential for prolonging the harvest. 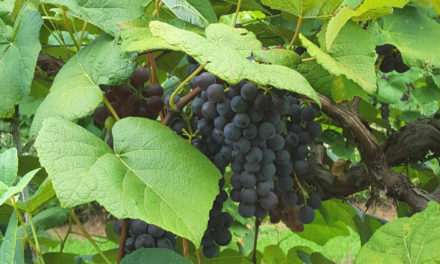 A plant’s goal is to reproduce; therefore, if its fruit are allowed to fully mature on the plant, there is no reason for it to continue flowering, which means fruit production will halt. Storage times provided below are for freshly harvested produce. Store-bought produce will likely have shorter storage times due to the time between harvest and being purchased in the store. For more information on storing fresh vegetables, see HGIC 3483, Selecting & Storing Fruits & Vegetables. Asparagus: Wait to harvest until the third year after planting. Spears 6 to 8 inches tall are best and should be cut or snapped off just below the soil surface before the tips begin to separate. Cutting too deeply can injure the crown buds that produce the next spears. If the asparagus is allowed to get much taller than 6 to 8 inches, the base of the spear may be tough and will have to be cut. Asparagus can be stored in plastic bags in the refrigerator for up to a week. Bean, Lima or Butter: Harvest when pods begin to bulge and are filled (seeds just touching each other). Open a few pods to check. Yellowing pods are over mature. For tender limas, harvest when slightly immature. Shelled beans can be stored in the refrigerator for about a week. Bean, Snap: Harvest while the pods are still tender, before the enlarging seed can be seen through the pod. Pods are ready when they break easily with a “snap”. To harvest beans, break off the stem above the cap. Beans are best when used as soon as possible after harvest, but they can be stored in the refrigerator for a few days if cooled immediately. Beet: Harvest beet roots when they are 1½ to 2 inches in diameter. Beets allowed to get larger than 2 inches in diameter may be woody. Tender greens (6 to 8 inches long) may also be harvested and eaten. Fall-planted beets should be harvested before the first moderate freeze. Harvest spring beets before hot weather (June). Beets can be stored in perforated plastic bags in the refrigerator for up to 2 weeks. Broccoli: Harvest when the main head is 3 to 6 inches in diameter and the flower buds are still tightly closed. Cut the main stem about 6 inches below the top of the head. Some varieties may produce secondary florets in the stem axils after the main head has been harvested. Broccoli can be stored in perforated plastic bags for up to a week in the refrigerator. Brussels Sprouts: Harvest sprouts when they are firm and 1 to 1 ½ inches in diameter. Start from the bottom of the plant and move up. Twist or cut sprouts from the stem. Harvest all sprouts before the first severe freeze. Sprouts can be stored in perforated plastic bags for up to 3 weeks in the refrigerator. Cabbage: Harvest when the head is solid, firm and has reached adequate size depending on the variety and growing conditions. Once cut, move it out of the sun as soon as possible. Cabbage will “sunblister” and lose weight in direct sun. Cabbage can be stored in the refrigerator for a month or more. Carrot: Harvest roots when they reach desired size (typically ¾ to 1 inch diameter). Fall carrots, if mulched, may be left in the ground and dug as needed over winter. Otherwise, carrots with tops removed can be stored for 4 to 6 months at 33 °F and high humidity to prevent wilting. Carrots with tops left on will not store as long. Cantaloupe (Muskmelons): If, when gently pulled, the fruit separates easily from the stem, it is fully ripe and at its best eating quality. Also, surface netting turns beige and the blossom end becomes soft and smells sweet. If not consumed or cooled soon thereafter, its quality will deteriorate. Some honeydew varieties will not slip (separate easily from the stem) but will become paler in color. Cantaloupe can be stored in the refrigerator up to 10 days. Cauliflower: For the cultivars that do not self-blanch (become white), tie up the larger leaves when the head first begins to appear to exclude sunlight from head. Harvest when head is firm, 6 to 7 inches in diameter and before curds begin to separate, typically 10 to 15 days after tying leaves. Leave a ruffle of leaves surrounding the head when harvesting to prolong quality. Cauliflower can be stored in perforated plastic bags for up to a week in the refrigerator. Chard, Swiss: Remove mature, outer (oldest) leaves by cutting or breaking stems 1 inch above the soil line, or harvest “baby” leaves for salads. May be harvested continuously until flowering. Swiss Chard can be stored in a plastic bag in the refrigerator up to 2 weeks. Collards: Flavor is improved after frost. Entire plants can be cut when very young, half-grown or full-grown. Tender leaves can also be harvested from full-grown plants. Collards can be stored in a plastic bag in the refrigerator up to 2 weeks. Corn, Sweet: Harvest when the husk is still green and the silks are dry and brown. Kernels should be plump and tender. Sweet corn loses sugar from the kernel rapidly at high temperatures. Pick in the cool temperatures of early morning and cool the ears immediately after harvest. Eat fresh as soon as possible after harvest. Otherwise, store as close to 32 °F as possible in a moist environment. Sweet corn can be stored under optimal conditions for about five days, but will lose sweetness with each day of storage. Cucumber: Begin harvesting when cucumbers are about 2 inches long up to any size, but before their flesh becomes bitter, seeds harden or skins begin to yellow. Pickling types should be harvested between 2 and 6 inches in length, while slicing and burpless types are typically picked between 6 and 10 inches long. Pick as frequently as necessary to avoid oversized fruit and to encourage continued production. Harvest the fruits by cutting stems with a sharp knife or pruners. Store cucumbers in the refrigerator for about a week. Eggplant: The fruits of eggplant may be harvested at any time after they have reached sufficient size, but should be removed from the plants before the flesh becomes tough and seeds begin to harden. Fruit should be large, shiny and a uniform color. The fruit is ripe when the side of the fruit is pressed slightly with the thumbnail and an indentation remains. Harvest the fruits by cutting stems with a sharp knife or pruners. Eggplant will store in the refrigerator for a week. Garlic: Garlic is ready to harvest when the leaves begin to yellow in early summer. Lift up the entire plant by hand or with a spading fork, being careful not to bruise the bulbs. Brush off the soil but do not wash the bulbs. Cure in a warm, shady place with good air movement. Hang in bundles or spread as a single layer on screens or drying racks. Allow bulbs to dry until the neck is dry and the outer skin is papery, approximately 2 to 3 weeks. Remove tops when dry. Store by braiding or tying several heads together and hanging up or by cutting tops off and placing bulbs in a mesh bag. Most varieties will keep for 6 to 8 months in a well-ventilated, cool, dry area. Greens (Mustard, Turnip, Kale): Harvest entire plants (or outer leaves for continuous harvest) when leaves reach suitable size (6 to 10 inches long) and before they start to yellow. Wash, dry and chill immediately. Greens can be stored in a plastic bag in the refrigerator up to 2 weeks. Kohlrabi: Harvest when swollen stems are 2 to 3 inches in diameter. Larger stems may become tough and woody. Cut off just above the soil line and trim tops. Kohlrabi can be stored in a plastic bag in the refrigerator for 2 to 4 weeks. Lettuce, Head: Head lettuce is mature when leaves overlap to form a head similar to those available in stores. Harvest entire head by cutting stem near the soil line before hot weather causes lettuce to turn bitter and bolt. Store in the coolest area of the refrigerator. Head lettuce can be stored for 2 weeks under optimal conditions. Lettuce, Leaf: Harvest entire head or individual outer leaves before hot weather causes lettuce to turn bitter and bolt. It can be used as soon as plants are 4 to 6 inches tall. Bibb lettuce is mature when leaves begin to cup inward to form a loose head. Cos or Romaine is ready to use when the leaves have elongated and overlap to form a fairly tight head about 6 to 8 inches tall. Store in the coolest area of the refrigerator. Leaf, Bibb and Romaine will store as long as 4 weeks if the leaves are dry when bagged. Okra pods are best when picked at 2 to 3 inches long. Okra: Harvest when pods are 2 to 3 inches long. At this stage the pods are still tender. Larger okra pods tend to be tough and fibrous. Round-podded okra varieties remain tender at larger pod sizes and are good to use for slicing and freezing. Okra grows very fast; therefore, it must be harvested every 2 days. Do not allow pods to mature on the plant because this will inhibit flower production and thus reduce total productivity of the plant. Handle okra carefully because pods bruise easily. Okra can be stored in the refrigerator for about 7 days. Onion, Dry Bulb: Harvest bulb onions when about three‑fourths of the tops have fallen over. Remove tops by cutting 1 to 1½ inches above the top of the bulb. Thoroughly air-dry bulbs in a shaded area before storage. Store the dry bulbs in shallow boxes or mesh bags in a cool, well-ventilated place. Ideal conditions are between 45 °F and 55 °F and 50 to 60 percent humidity. Onion, Green: Harvest green onions when tops are 6 to 8 inches tall and before flower stalks form. Green onions can be stored in a plastic bag in the refrigerator for up to 2 weeks. Pea, Garden: For shelling, pick when pods are firm and feel full, but before pods begin to yellow. Taste test for sweetness. Peas should be shelled and eaten soon after harvest because quality declines rapidly. For edible-podded types, harvest early and often when pods are fully elongated (about 3 inches), but before seeds are more than 50% of their full-size (about a week after flowering). Wash and cool immediately. Store unshelled peas in a plastic bag in the refrigerator for about a week. Pea, Southern (Crowder, Black-eye, Purple Hull): Harvest Southern peas when the individual seeds begin to swell in the pod, but before many pods begin to lighten in color and dry out, as this is the best age for shelling and eating. Southern peas vary in maturity dates from around 65 to 125 days. Experience is a good teacher for determining the proper picking time. Immature pods may be picked and broken into the pot as “snaps.” Only the youngest and most tender pods should be used in this fashion. Fresh pea pods are very perishable and should be quickly moved to a shady area and spread out to avoid spoilage by heat. The harvested product should be shelled and processed rapidly. Shelled or unshelled peas can be stored in the refrigerator for several days. Pepper, Hot: Hot peppers may be picked green or allowed to ripen and change colors on the plant. Entire plants may be pulled and hung just before fall frosts. Jalapeno peppers should be harvested when the fruit turns black-green. Peppers can be stored in the refrigerator for 2 to 3 weeks. Using pruners, scissors, or a knife to harvest may be better for some plants than breaking stems by hand. Pepper, Sweet: Harvest sweet peppers when they reach full size, the fruit walls are firm and the peppers are still in the green or yellow state, or allow them to ripen further for red or orange peppers. The stems of pepper plants are brittle. When harvesting the fruit, cut the stems instead of pulling to avoid breaking branches. Varieties turn from green to red, yellow or chocolate when allowed to mature on the plant. Bell peppers can be left on the plant to turn color; however, they should be picked as soon as they change to the desired color. Fully colored peppers are sweeter than green peppers. Store peppers in plastic bags in the refrigerator for 2 to 3 weeks. Potato, Irish: Harvest potatoes after most of the vines have died; a spade fork is useful for digging. Handle as gently as possible during harvest. Avoid damaging tubers when digging and avoid long exposure to light. Leave the tubers exposed to the sun just long enough for the soil to dry and fall off (usually about 1 to 2 hours). Potatoes for use in early summer (“new potatoes”) may be dug from 2 weeks after flowering until the vines die. Dig early potatoes when tubers are large enough to eat. Irish potatoes can be stored in a dark, humid, well-ventilated location at 45 to 60 °F for 2 to 4 months. Freshly dug sweet potatoes need to be cured before eating or storing. Potato, Sweet: Harvest sweet potatoes when 30 percent are larger than 3½ inches in diameter. Harvest before frost because cool soil temperatures can reduce the quality and storage capacity of the sweet potatoes. When harvesting, it is best to cut and remove the vines before digging. Be careful while digging the sweet potatoes, as they are easily damaged. Also avoid rough handling as they are easily bruised. Sweet potatoes should be cured to heal wounds and to convert some of the starch in the roots to sugar. The optimal conditions for curing are to expose the roots to 85 °F and 90 percent humidity for one week. Few home gardeners can supply these conditions, so they should place the sweet potatoes in the warmest room in the house (usually the kitchen) for 14 days. No curing will occur at temperatures below 70 °F. After curing, store the sweet potatoes in a cool location. Never expose them to temperatures below 50 °F and never refrigerate them. Temperatures below 50 °F will result in off flavors and possibly rot the sweet potatoes. Sweet potatoes can be stored under good conditions for over 6 months. Radish: Plants develop very rapidly and roots will be ready to harvest in about 3 to 4 weeks after planting from seed. Check the plantings frequently to prevent over maturity. Round red radishes should be harvested before they are an inch in diameter. Larger radishes will usually be pithy and have a strong flavor. White radishes should be harvested before they are about ¾ inch in diameter. Radishes can be stored in the refrigerator for about 2 weeks. Rutabaga: Rutabagas will get larger if they are planted early enough. They can be eaten at smaller sizes, but start harvesting them when they reach the size of a softball (3 to 4 inches in diameter). Pithiness and/or a very strong flavor can develop if these crops are left in the ground during hot weather. Also, do not leave them in the ground during hard-freezing weather. Roots store well in plastic bags in the refrigerator or in a cold root cellar for several months. Soybean, Edible (Edamame): Harvest when pods are plump and fully filled, but are still bright green. The harvest window is only a few days. Pick individual pods or whole plants early in the morning and chill immediately after harvest. Edamame can be stored in plastic bags in the refrigerator for up to 2 weeks. Spinach: Harvest dark green, tender leaves that are 3 to 6 inches long by picking individual leaves or cutting leaves. Start by picking the outer leaves and harvest the newer leaves as they reach the desired size. Whole plants may be harvested by cutting just above the crown (growing point). Remove the petioles (leaf stems) if they are too large and fibrous. Rinse then dry the spinach using paper towels or a salad spinner. Store spinach in plastic bags for up to 2 weeks in the refrigerator. Squash, Summer: For optimum quality, harvest while fruits are tender and still have a shiny or glossy appearance. When growing conditions are favorable, harvest the crop daily or every other day. Harvest crookneck and straightneck varieties when fruit is 1½ to 2 inches in diameter. Harvest zucchini when fruit is 7 to 8 inches long and scallop types when they are 3 to 4 inches in diameter. All of these squash can be harvested at smaller sizes for extra tenderness. Do not leave large fruit of summer squash on the plant because this will inhibit the development of additional fruit. Store summer squash in a plastic bag in the refrigerator for up to 1 week. Squash, Winter: Harvest mature winter squash when they have very hard skins that cannot be punctured with your thumb nail. In addition, the fresh, bright, juvenile surface sheen changes to a dull, dry-appearing surface. Harvest only solid, mature pumpkins with deep orange color. Cut the fruits from the vine (do not tear them), leaving a generous stem. Be careful not to injure the rind or break off the stem as decay fungi can attack through wounds. 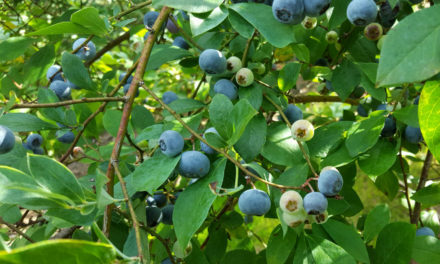 Do not harvest or handle wet fruit or allow harvested fruit to get wet. After harvest, wash with soapy water to remove surface dirt. Then dip fruit in a dilute chlorine solution of 4 teaspoons bleach per gallon of water or wipe with a clean cloth dipped in chlorine solution. Allow fruit to dry, but do not rinse until use. Cure by maintaining storage temperatures between 80 to 85 °F with 75 to 80 percent relative humidity for approximately 10 days. Store fruit at 50 to 55 °F and 50 to 75 percent relative humidity with good ventilation. Under these conditions, squash and pumpkins can last 8 weeks or more. Although they still have a little green, these tomatoes are ready to be harvested. Finish ripening them at room temperature. Tomato: Pick fruit when it is fully vine-ripened but still firm; most varieties are dark red, but many other colors are possible depending on variety. Harvested tomatoes should be placed in the shade. Ripen immature (green) fruits at 70 °F. Light isn’t necessary for ripening green tomatoes. Green tomatoes can be stored at 50 to 70 °F for one to three weeks. Ripe tomatoes can be stored at room temperature (70 °F) or in the refrigerator for 4 to 7 days. However, refrigeration can reduce flavor and cause the tomatoes to develop a mealy texture. Turnip: Harvest turnip roots when they reach the size of a tennis ball or larger (2½ to 2¾ inches in diameter). Pithiness and/or a very strong flavor can develop if these crops are left in the ground during hot weather. Also, do not leave them in the ground during hard-freezing weather. Roots store well in plastic bags in the refrigerator or in a cold root cellar for several months. Watermelon: There are several indicators for ripeness of watermelon. The vine tendril closest to the fruit dies and turns brown when ready to harvest. Also, the underside of the fruit will turn from white to yellow. Finally, thumping a ripe melon should give a dull thud as opposed to a ringing, metallic sound when immature. Watermelon can be stored at room temperature for about a week or for 2 to 3 weeks in the refrigerator.